Time for another round of Yvo’s Shorties! This time around two completely different stories I both ended up enjoying. 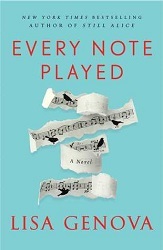 Every Note Played by Lisa Genova and The Cheerleaders by Kara Thomas, both Goodreads Choice Awards nominees. This is already my third Lisa Genova story… I’m always in awe how she is able to put a devastating neurological disease in the spotlight, mixing medical facts and symptoms with a fictional story in such way that you end up both being educated and entertained at the same time. This balance between facts and fiction is what makes Every Note Played such an interesting read for me. It’s not just a simple description of ALS and its symptoms. 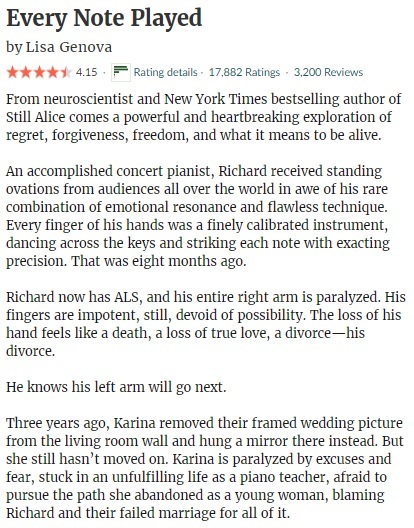 Through the main character Richard we get to see exactly how this disease evolves and what effects it has on both his life and those close to him. This impact is shown really well through both Karina and Bill, and in a lesser role Grace and other characters as well. As always, I enjoyed the writing style and the way the story was told, although I do have to say I wish there would have been a bit more focus on the character development itself. I understand and appreciate a very present role of ALS in the story, but it did make me feel the main characters as persons were pushed a bit in the background. I would have liked to learn more about Richard and Karina and their background. I guess this would have made it easier to connect to them straight away… I loved the musical element though, and how music played a role throughout a story. In short, despite a few minor details Every Note Played was without doubt another excellent and fascinating read. After really enjoying Little Monsters last year, I’ve been looking forward to read more of her work. 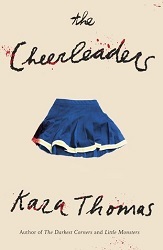 It took me longer than expected, and it isn’t the book I originally planned to read first, but that doesn’t mean I wasn’t excited to be starting The Cheerleaders. There was just something about the blurb that caught my attention, although the blood spatters on the cover alone weirdly made me want to read this story already. A possible high school murder mystery with cheerleaders involved? Talk about an interesting twist! I already knew I was probably going to enjoy the writing style after Little Monsters, and my instincts were absolutely right. There is just something about the writing that draws you right in, makes you forget about your surroundings and just read. 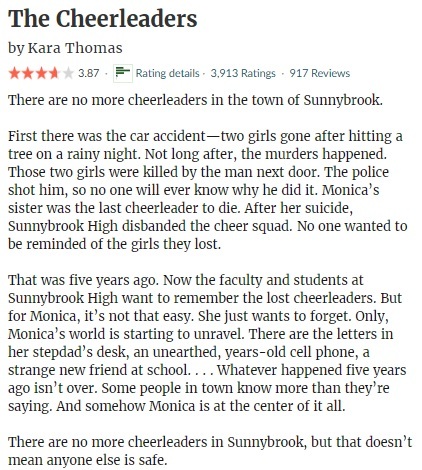 I was intrigued from the start, and even though not all characters are likeable and there are a few high school cliches involved, somehow the mystery around the death of the five cheerleaders was enough to forget about those objections and keep on reading. Entertaining and twisty enough to finish it in record time. The Cheerleaders is without doubt one of the strongest YA contemporary/mystery reads I’ve had the chance to read this year, minor flaws and all. 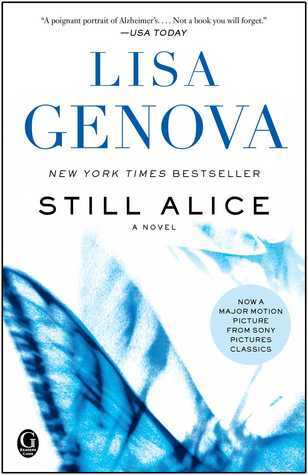 It’s time for another round of Yvo’s Shorties… This time around I will be reviewing Still Alice by Lisa Genova and the ARC The Silent Children by Carol Wyer, both read last year and both great reads for different reasons. Let’s continue with the reviews, shall we? Basically I accidently saw the movie on Netflix and just HAD to pick up my copy of Still Alice straight away, because I normally never watch the movie first. I’ve been meaning to pick up this story for ages now, especially since I really enjoyed Lisa Genova‘s other book Left Neglected, but I guess I needed this little push to finally do so. I’m glad I did, because there is no doubt that Still Alice is GOOD. The writing is very engaging and made me fly through this story… The plot and character development are both tragic, heartbreaking and heartwarming at the same time. 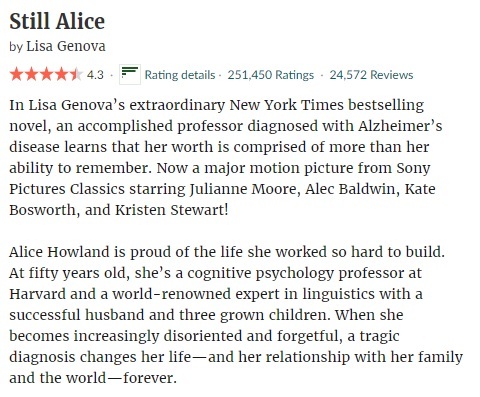 I’ve seen what Alzheimer can do up close, so I can relate somewhat to what the characters are going through… The descriptions of what Alice is going through are excellent, detailed and give insight of what it is like both having Alzheimer and what effects it has both on the person and those around them. 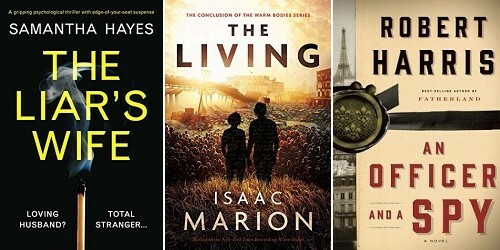 All in all an excellent contemporary fiction read I can recommend to fans of the genre. I’ve been a fan of the DI Robyn Carter series ever since the first book, and this is already the fourth book of the series published. Things are moving fast! 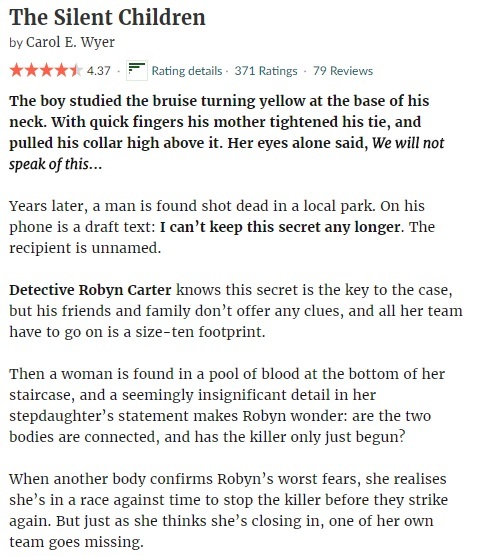 Fast-paced, engaging, suspenseful and always a new intriguing mystery and bad guy to hunt: DI Robyn Carter never lets us readers down. And The Silent Children is without doubt another winner. While I think I ended up enjoying it slightly less than book two or three (for reasons I can’t exactly put my finger on), there is no doubt this fourth book is still an excellent detective thriller that simply delivers. The case Robyn Carter and her team has to work on this time is another interesting one and wrapped in a big pile of secrets all there waiting for someone to uncover them. 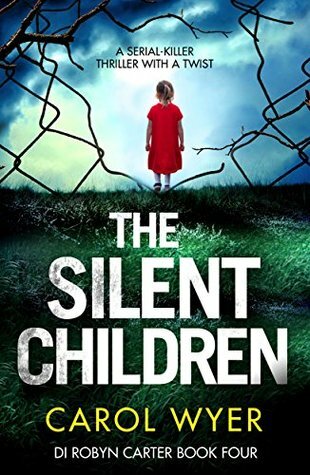 The mystery around the deaths and what is happening will keep you reading until you finally find out exactly what is going on… The Silent Children is without doubt a great addition to this series!